A. Kimberley Wells is a 29 year old cyclist and doctor born in Coonamble, NSW, currently residing in Canberra, ACT. Wells is married to aeronautical engineer and ex-air force officer, Douglas Lampe. 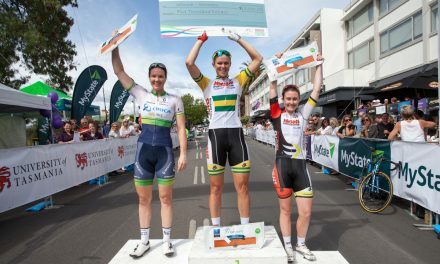 She studied medicine at James Cook University in far North Queensland before pursuing her medical and cycling careers in ACT. 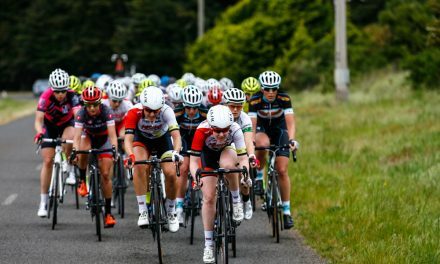 Under coaching from Olympic gold medallist, Sara Carrigan, Wells won her first national road criterium title in 2013 and has raced in USA & Europe since. 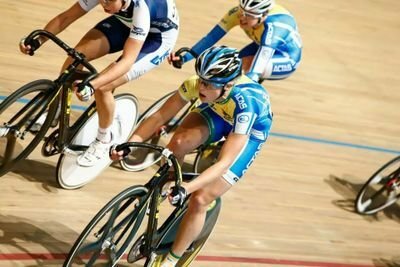 Currently she is channelling her energies into a successful debut in track racing with ACT Academy of Sport (ACTAS), having already claimed a silver medal at the omnium track nationals in December 2014. A. I can never answer this well. I just love being on a bike. Always have. Always will. I’d like to think my passion for bikes started aged 4y.o. when I rode my brother’s BMX without training wheels for the first time. My progression to road & track cycling however, happened in my 20s. A. I’m an avid sports fan, having tried my hand at many other sports across the years, including swimming, soccer, cricket, tennis, netball, martial arts and athletics. I love sports, medicine and the outdoors. My favourite thing is to share my experiences with my husband, Doug. A. Racing the criterium and road circuit in USA. Tulsa Tough, Stage 3, “Cry Baby” Hill Criterium. Oklahoma. Awesome team & amazing atmosphere. The road is a sea of spectators in costumes that parts only long enough to race through. Plug “cry baby hill” into YouTube to see why. A. The High5 Dream Team will be the strongest and best-supported team in the NRS. It is a collection of punchy riders with the assortment of talents from climbers to time-triallists and sprinters. A. 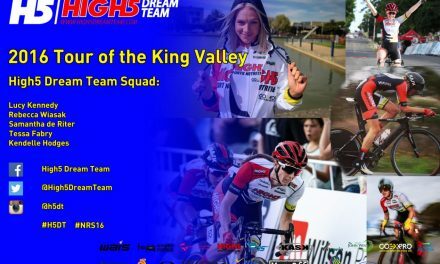 The High5 Dream Team fulfils a valuable link between the domestic and international racing platforms, giving riders the opportunity to develop and hone the skills required to race overseas. Rochelle Gilmore is an astute business woman involved in a plethora of exciting projects across cycling. Coupled with the successful pedigree of athletes rising under instruction from ‘supercoach’, Donna-Rae Szalinkski; it’s an exciting project. A. I hope to learn even more about myself and team race tactics with Donna at the DS-helm. I’m anticipating some exciting race prospects in both road and track throughout 2015. A. Café time with friends. A. Bircher muesli & coffee. A. Win loads of stages. Collect sprint jerseys. Help my team mates to win stages that suit their specialties. A. I had a tumultuous 2014; in the short term my goals are for a successful return to the women’s peloton. In the long term I can see myself achieving many goals on the track.